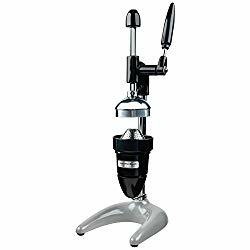 Over the time we spent reviewing manual hand press juicer models on the market we realized that the Hamilton Beach 932 Commercial Citrus Juicer is one of the best pieces of machine work we have come across. Unlike many other manual juicer machines on the market that have a certain design which allows for a unique press and maneuver function during juicing, the hamilton beach design from the get go is a totally different design as can be seen below. It is obvious from first glance, the design of the hand press greatly stands out from several of the manual juice press items on the market today. The look has a total classic feel and is built with a rack and pinion gearing which allows the user to exert up to two thousand pounds of pressure with out applying little pressure. If you would compare this to a much more larger manual commercial juicer you will know that some orange juicer machines out there on the market require you to use a lot of arm strength, which could potentially make you go sore. The unit itself is able to exert about 2,000 pounds of pressure in total which is a ton of juicing weight for such a size of a hand press. The juicer handle unlike others stays in the up position while many other machines may have a lever that is swung down. This “up” position on the top of the machine allows for the user to easily and very seamlessly add more fruits during the juicing process. In addition to the extremely simple and easy juicing you also have the pulp, pith, peel, and oil which is separated and stays behind in the strainer cone. The strainer cone can then be easily removed to the side in order to be cleaned and taken care off before the next juicing session. The swing out drip cup at the bottom of the machine allows for efficiency for smaller citrus fruits and it also is able to swivel along to the side which allows for glasses to be even up to 5 and a half inches in height. The swing out drip cup allows for the juice to be collected in an easy and efficient manner. All though this manual press is not as heavy duty and rugged as the jupiter large commercial juice press this juicer is still one heck of a force to be reckoned with and definitely can be classed as a strong and powerful orange hand press. Now that we have a basic idea of the build of the hamilton beach 932 lets take a look at some of the main elements that make this orange juicer machine stand out from others in the market and why we highly recommend this unit to any avid juicer. 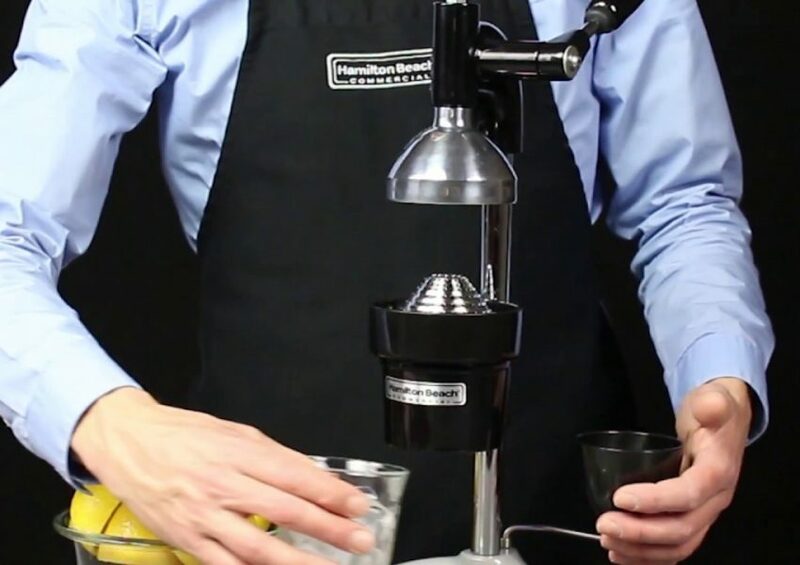 The Hamilton citrus press has a 2,000lb extraction pressure which allows for up-most and maximum juice output for efficient and smooth juicing. A heavy duty set of gears within the build allows for powerful and long term performance. Included in the build is a rack and pinion gearing which allows for up to date technology in the manual juicing gears. The strainer cone and the funnel in the machine are very easy to remove and clean. Considered one of the most long lasting orange juicer machines on the market. A very unique press and function design which allows you to juice without exerting much arm strength, the machine practically takes care of most of the juicing with little to no pressure. This gadget is a bit more on the pricier side however for the unique design a functions you get with this machine it is no wonder why. We have been using this juicer for almost 2 years now and we use it almost on a daily level for mixed drinks and for guests. For many people who use juicers a year of this kind of use will take a real toll on their machine and this can be seen in the quality of the juice as well as the use of the lever. The construction on the hand press remained practically the same since we purchased the unit two years ago. The larger and stronger pressure cup on the hamilton beach juicer allows for the job to get done quickly and efficiently. Another unique feature that we did mention earlier is the fact that the juicer has a strainer with small round holes all over the places rather than in select areas. This allows for the juice to be easily sent through the strainer and almost all extra stuff to be completely filtered out from the juice. If you look at more conventional juicers whether they are manual or electric you will notice that they may have larger but fewer holes. All though this does a good job in keeping extra foilaige out it doesn’t necessarily allow for a smooth stream line level for juice flow. If you are looking for a high quality juice after juicing and prefer to have sweet orange juice this also is able to keep out extra oils which allow for the juice to actually taste a lot sweeter. Additional to the juice tasting sweeter the extra oils that are strained out increase the flavor of the juice after it has been squeezed to perfection. To give our readers a good idea of how much juice we squeeze with this unit we would have to say we squeeze about a hundred fruits a day ranging from oranges, grapefruit, lemons and limes. If you ask any avid juicer in the game you will know that this is one hell of alot of juicing. Overall we highly recommend this juicer to any serious juicer out there!